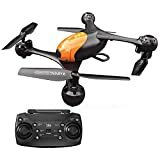 Blade Nano QX Drone Review 2019 – is the Blade Nano QX quadcopter worth the money? Review of features, pricing, flight duration, battery, camera and more. The Blade Nano QX Drone is basically a simple and easy-to-maneuver quadcopter that delivers lots of fun. Designed for indoor flight, this drone is sufficiently stable for beginners and agile enough for skilled flyers. Thanks to its nifty design and tough construction, it is not likely that this drone will break or break things when it crashes. It is a great option for first-time drone fliers who would like to master the complex technique of flying a quadcopter. The ready-to-fly Blade Nano QX Drone only needs the battery charged and inserted to get it flying. The design of the quadcopter is simple; it has a printer circuit board and its frame is made out of one piece of light plastic; however, it is adequately tough to endure most crashes. The canopy is clipped on top and the battery is secured underneath it. The battery life is rather short. The company claims it lasts 8 minutes but actual flight time is just under 7 minutes; this is quite typical for these small drones. The battery life was measured by testing the length of time the drone can keep a stable, hovering position. Therefore, your flight time could be shorter if a lot of zooming is being done. The 150-mAh battery does not last very long; however, spares are inexpensive; a pack of four can be purchased for under $20. The included USB adapter is used for recharging and a complete recharge typically takes roughly 25 minutes. The inclusion of prop guards is a very nice touch. These are small plastic pieces that extend out of the frame outside the 4 rotating propellers. Inevitably, you will fly sideways into an obstacle and these guards will prevent the blades of the propeller from hitting it. However, they are not foolproof: if the drone flips over and crashes, the blades could still be caught. The Blade Nano QX Drone uses a two-stick remote control designed to look like an Xbox controller. The controller fits nicely in the hand and the sticks naturally fall under the thumbs. The drone has an aileron control that tilts to the left and right and a rudder that rotates the QX to the left and right. To descend and ascend, the throttle control will handle that and the elevator control moves it from left and right. The remote control has an approximate range of 40 feet, which is sufficient for a small, indoor quadcopter. The weight of the Nano QX makes it maneuverable and zippy; however, this means it is blown off course easily. There is very little effort required to move the throttle stick. In fact, it is a tad too easy to knock it by mistake and send the drone flying away. A power switch is located between these two sticks, which is responsible for turning the controller on or off. In addition, the ring of the stick has buttons around it that allow for trimming the sticks to regulate their sensitivity. Four AA batteries are used in the remote. The Blade Nano QX is a joy to fly. This drone can quickly turn and climb, zooming around at a relatively decent speed. It quickly reacts to the controls and as such, precise flying is possible when you get accustomed to the controls. When the battery is first connected, there is a blue LED that blinks until it is placed on a flat surface. After detecting that it is still and on the ground, this LED changes into a solid blue and the throttle can be started to prepare for takeoff. This same level of detection works well and is known as SAFE (Sensor Assisted Flight Envelope). Among the most innovative and outstanding features of the Blade Nano QX Drone is it SAFE technology. The system has two flight modes; stability and agility mode, which makes the drone quite user friendly, especially for beginners. In the stability mode, this technology will allow the drone to automatically hover in one position when the controls are released. If you are learning to fly hobby drones or you are a beginner, this will be pretty handy. This system helps to prevent crashes and damages that would have been caused by a direct collision. Pressing on the left stick will deactivate SAFE; however, leaving it turned on is best unless you are skilled flier. 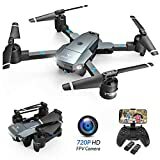 This is another toy drone that is rated among the best small and basic hobby drones. Apart from accelerometers and gyros that allows auto flipping and stabilizing, the drone has no special features. However, it has a small HD camera that can either be detached or attached with prop guards. The Hubsan X4 compares pretty well to the Nano QX drone when it comes to size. The Hubsan is roughly half the price of the Blade Nano QX and it is available in 4 different versions. The cheapest version sells for approximately $45 and the cost covers all the required controllers. However, the cheapest model lacks the agility mode for more seasoned drone pilots, like the Blade Nano QX does. The Blade Nano QX Drone is an exceptional quadcopter with many features designed to satisfy both veterans and beginners. It is very lightweight, highly agile and has superb maneuverability. 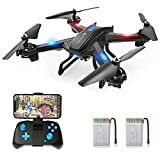 The available toy grade quadcopters are mostly built with cheap materials and lack production quality. However, the Nano QX has a remarkable build quality, making it ideal to fly pretty much anywhere.